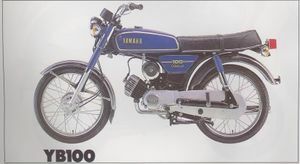 The Yamaha YB100 was classed as a moped, since it had a 50cc engine and pedals, but the latter folded to act as footrests and it had a sporting performance and image. It had a disc-valve two-stroke engine and four-speed gearbox, simple construction, and was to run on into the 1990s offering basic transport, adequate performance and minimal running costs. This page was last edited on 30 November 2010, at 18:13.